The asscher cut diamond was originally crafted in 1902 by Asscher brothers from whom the cut derived its name. Just like emerald cut, this too is uses step cut facets to bring on an elegant, assertive beauty and sparkle. This gemstone has an octagonal shape with distinctive cropped edges. Asscher cuts give off a timeless effect of vintage beauty most associated with the revolutionary Art Deco Era that appreciated symmetry and finesse. Just like Emerald cut diamond, asscher cut though radiates sparkle and brilliance, it is more subdued and subtle, yet charismatic. The asscher cut was developed the better qualities of the princess and emerald cuts with X-shaped facets cut from the corners to its centre culet. A finely cut asscher has 58 facets and appears to have concentric squares similar to the mirror effect an emerald cut has, as you gaze down through the table of the diamond. The result is the appropriate positioning of the pavilion. The brilliance of its faceting can mask certain inclusions however, because of the open table of the crown, simple facets, clean and balanced appearance some inclusions and colour are quite visible in lower grades. The step cut emphasizes the clarity of the diamond, and it is ideal for showcasing higher clarity diamonds. The grand appearance of vintage asscher cut diamond has long been looked upon with admiration. Set beautifully in rings and neckpieces the royal asscher cut diamond with its elegant and neat cuts and hall of the mirror effect exudes unparalleled beauty. This astounding cut was invented in the year 1902 by the Asscher Brothers of Holland. As it suggests this cut was named after its inventors. It is an amalgam of princess and emerald cut with distinctive X-shaped facets from corners to culet. By 20th century new and improved diamond cutting were brought about. 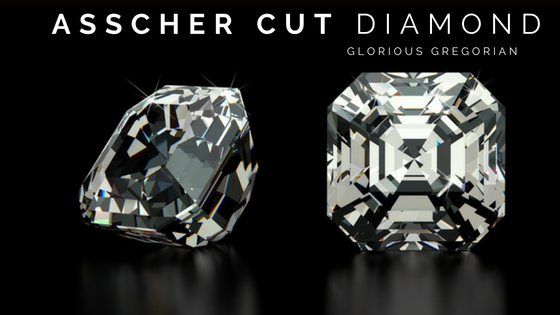 Using these new techniques, Asscher brother, Edward and Joop Asscher re-imagined the asscher cut, with an intention to improve the overall cut and quality. They raised the crown and added even more facets. In 1999, the brothers first introduced the “Royal Asscher Cut” almost after a century since the original diamond cut was created. The royal asscher cut has a whopping 78 facets as compared to the initial 58 facets. However the classy elegance of original asscher cut still persisted. With the advent of Art Deco Era, Asscher cut diamonds rose to fame in the late 1920’s, because of their appreciation for symmetry and clean, distinctive facets. However it’s popularity dwindled during and post-World War 2. It is only in recent time with the creation of the Royal Asscher Cut that the diamond shape resurged to fame. Recently few years back in 2002, the shape gained much recognition when people began experimenting with it rather than the Round or Princess cut diamond. Many celebrities including Jessica Alba, Kate Hudson, Zooey Deschanel and Ashlee Simpson have been seen wearing asscher cut diamond jewellery. Most infamous of all is a massive Krupp Diamond set as an engagement ring was gifted to Elisabeth Taylor by her beloved Richard Burton. An asscher cut diamond is designed to draw the attention with cropped corners and distinctively cut pavilion and crown that produce wider flashes of brilliance. Because of its open table it is more prone to show off inclusion this is the reason why it is said that, ideally one should always select the highest clarity grade that can be afforded. In most cases premium price is associated with asscher cut diamonds with high colour grades. Great demand forcolor range between D-F scales has driven huge premium andits buyers are prepared to pay the substantial price. Another factor for higher price is that, Asscher cut diamonds tend to have some depth and hold weight in the centre, making them look visually smaller than emerald cut diamonds and even round cut diamonds. However, because of the ability of asscher cut diamond to retain a lot of carat weight with least possible loss (approximately 65% - 75%), they have less per carat rate. Considering all these factors one can easily get the classy elegance and sparkle of the vintage asscher cut in quite a discounted rate. The average discount of asscher cut diamond to a round cut diamond of same carat weight can go upto 15%. - Colour: Because of its clean facets and open table Asscher cut diamonds tend to maximise colour so it is always better to buys a higher grade diamond, possible G grade and above. H grade also looks quite stunning. But make sure not to indulge below H grade. - Clarity: Same applies to clarity as it does to colour. The open table tends to show off inclusions easily. So it is recommended while selecting an Asscher cut diamond one should never compromise below VS2 clarity grade. - Length to Width Ratio: Ranging between 1.00 to 1.05 is the GIA’s acceptable range for square asscher cut.